Bob and Mike Bryan headline a doubles field in Atlanta that includes eight players ranked in the world’s Top 30 of the ATP doubles rankings. ATLANTA – Starting with the Bryan brothers, current champions of all four Grand Slam tournaments and the 2012 Olympics, doubles action will highlight the show at the BB&T Atlanta Open, which is taking place July 20-28. Tournament Director Bob Bryant said with eight competitors ranked in the world’s Top 30 of the Emirates ATP Doubles Rankings, the doubles draw will be the strongest ever at the Atlanta tournament. This is the first men’s tournament of the nine events in the Emirates Airline US Open Series. Headlining the doubles draw will be the world's No. 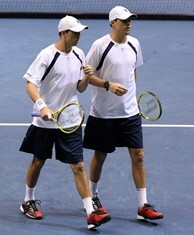 1 team of Bob and Mike Bryan. The twins have already made history this year by completing their version of the "Golden Slam," the first time a doubles team has held the titles of four majors and the Olympics. Additionally, they own the records for most men’s Grand Slam titles, most career titles and the most number of years as the No. 1 team in the world. The second seed in the doubles draw will be Ivan Dodig of Croatia and Marcelo Melo of Brazil, who lost to the Bryans in the Wimbledon final this month. "This is the year for doubles, as we’re hosting the Bryan brothers, the best men’s doubles team of all time," said Bryant. "We could not be more excited for the high level of play each team will bring to Atlantic Station." Several Americans will be in the doubles draw besides the Bryans. Returning to the ATP World Tour for the first time since Indian Wells, Mardy Fish is partnering with Czech Radek Stepanek. Tournament defending doubles champion Ryan Harrison (with Matthew Ebden in 2012) is set to team up with his younger brother, Christian Harrison, this year. The Harrison brothers made it to the quarterfinals of the 2012 US Open. Americans James Blake and Jack Sock won the 2013 Delray Beach crown and will be playing together again in Atlanta. 2010 Atlanta titlist Scott Lipsky and Santiago Gonzalez join the doubles field with five ATP titles under their belts, including crowns in Halle and Oeiras this year. Two-time Atlanta semifinalist Colin Fleming will make has fourth appearance here alongside partner Jonathan Marray, both of Great Britain. Two-time Grand Slam singles champion Lleyton Hewitt and fellow Aussie Chris Guccione will also be competing. Connect with the BB&T Atlanta Open on social media by liking their Facebook Page, www.Facebook.com/BBTAtlOpen, and following on Twitter, www.Twitter.com/BBTAtlantaOpen with the hashtag #BBTAtlantaOpen. For more information about the BB&T Atlanta Open, visit www.BBTAtlantaOpen.com.